*3 year warranty replacement on this LED light (or LED bulbs for light fixtures with removable LED bulbs). After 30 days, the customer ships the failed LED light and/or LED bulb to Larson Electronics at their expense. If the failure is a manufacturer defect, we will ship a new replacement to the customer. If failure occurs within 30 days of receipt, Larson Electronics will provide a return label via email to the customer. When the failed light is returned, Larson Electronics will ship a new replacement. The Larson Electronics HALP-48-1L-LED-DNMS Hazardous Area LED Light Fixture is U.S./Canada UL Listed Class 1 Division 2 Groups A, B, C and D - UL 1598A listed, has a T4A temperatue rating and is specifically designed to handle the rigors of wet and corrosive marine environments. The HALP-48-1L-LED-DNMS hazardous area LED light fixture is designed for use in wet areas and saltwater-marine environments where corrosion resistance is critical to equipment longevity and safety. This Class 1 Division 2 rated fixture is constructed of non-corrosive materials including a polyester housing reinforced with glass fiber, a poured in gasket for reliable sealing and an impact resistant acrylic diffuser. Corrosion resistant stainless steel latches secure the lamp cover to the housing and provide a firm lock against the poured in seal to prevent drips and water intrusion. This fixture is UL 844 rated and Class 1 Division II, Groups A, B, C, D approved. The HALP-48-1L-LED-DNMS also carries a UL 1598A outdoor marine rating and meets US Coast Guard specifications. This lamp offers the extreme durability, high efficiency and long lamp life of high power LEDs in a proven hazardous location fixture design. The HALP-48-1L-LED-DNMS is equipped with our specially designed LED T-series bulbs which produce nearly 15% more foot candles of illumination at 8 feet as compared to standard T5 lamps when measured with an Extech light meter. The 24 watt LED lamps produce more illumination than standard T5 bulbs, but draw only 1/3rd of current. The HALP-48-2L-LED is multi-voltage (not multi-tap) and works on the following voltages: 120 Volt 60 HZ, 220 Volt 50 HZ, 240 Volt 60 HZ, 277 Volts 60 HZ. This fixture is ideal for open air hazardous locations where flammable chemical/petrochemical vapors may be occassionally encountered. Sensor Technology: The HALP-48-1L-LED-DNMS is equipped with an innovative and powerful day/night + motion sensor. 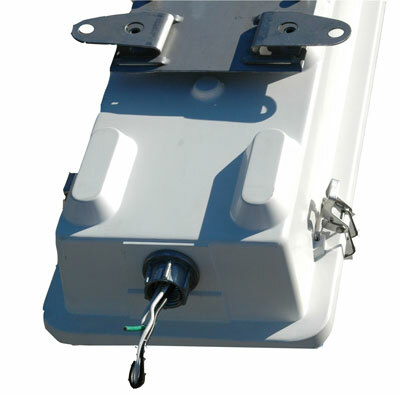 This sensor, which is located inside the light fixture itself, allows the HALP-48-1L-LED-DNMS to operate in one of several different and versatile modes. This LED light fixture can be set to be motion activated, day/night activated or in a combination of motion sensing and day/night modes. This high-tech sensor is also highly adjustable and allows operators to modify the following settings: motion sensor sensitivity, motion sensor time-delay and the intensity output level of the fixture. Having this degree of flexibility in operation and settings offers operators an incredibly versatile light fixture. Sensor Versatility: The impressive versatility of the motion + day/night sensor found in the HALP-48-1L-LED-DNMS LED light fixture allows for a lot of creativity in the setup of a single one of these light fixtures. However, the versatility is further increased when multiple units are to be installed together such as in a parking garage or other similar structure. Operators can take advantage of the sensor versatility to set up an energy efficient and automated lighting setup. Take a parking garage for example. 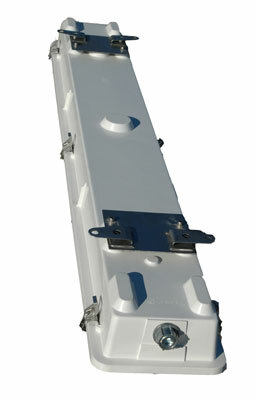 Operators would be able to set up a sequence of HALP-48-1L-LED-DNMS fixtures with alternating lights on seperate circuits. The first circuit would have sensors set to a lower lux level than the fixtures on the second circuit. This hypothetical setup would allow half the lights to come on as daylight began to fade and the rest of the lights would only come on once complete darkness had fallen. The fixtures could then be adjusted for motion sensing which would allow selected fixtures to power on when pedestrian or vehicle movement was detected and then turn off after an operator chosen interval to conserve energy. This is just one example of the flexibility and versatility that can be achieved with the HALP-48-1L-LED-DNMS . NOTE ON LAMPS: All hazardous location lights are shipped with bulbs. 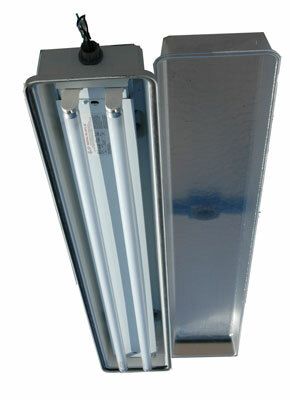 One 24 watt LED tube bulb with a color temperature of 5300K and a 50,000 hour life span come equipped with this fixture. Suggested Applications: The HALP-48-1L-LED-DNMS is designed for marine, wet, damp locations where corrosion resistant fluorescent lights are required. This includes petrochemical facilities, lubrication pits, oil drilling rigs, crew quarters, solvent/cleaning areas, water treatment areas, processing plants and marine loading docks. 6. Lamp cover-diffuser constructed of high impact acrylic for corrosion resistance and lamp protection. .
7. 1/2 inch, threaded access hole for wiring conduit.